I can't remember everything that happened the morning I woke. It comes to me in terrible slaps that are shari like glass son my memory, and I've been trying to piece it together. I remember that there wasn't enough air, and what air there was, was hot - too hot. I couldn't breathe because it boiled in my lungs, and I gagged on the alveoli bubbling up into my throat. I ran - ran out the door and maybe down the corridor, maybe down the fire escape - that part's foggy. I fled the room, fled the wing, fled the school. Fled my mind, Dee. The Dead House tried to keep me, to trap me, and I'm so afraid. I couldn't wake up. I couldn't open my eyes! It wouldn't let go of me. It was tricking me. I thought I could feel Carly with me in there, but I was wrong. It's something else. I don't know. I tried to leave, but the doors were all locked. My haven is a Venus flytrap. I can hear it calling to me even now while I'm awake. I can feel the walls, the damp, the rot - I can hear the churning Dead Sea. Sleep is the realm of the Dead Things, who want me. I must not sleep. I must not sleep. I am was am a child of the night - I even need it . . . and I am petrified of it. Some kind of joke, right? But it's true. And more than I'm afraid of the dark, I fear the light (ha ha). I fear the sun, and I fear the exposure. So, really, I'm not fit for life. One or the other, kid. And if I face the truth for too long, Dee, it'll break me. So I have to lie to myself to survive. I love scary books. I love the creep factor and feeling the chill of a perfectly written horror novel. I don't love the waking up at 2:00 in the morning convinced that somebody is knocking on my closet door (which leads to the attic), but that's the price I pay. The Dead House is the perfect book if you feel the same way I do. I love reading this story through Kaitlyn's entries, her doctor's notes and recordings of their sessions, as well as recorded sessions with a detective and various individuals connected to Kaitlyn / Carly. These varying narratives make this novel a uniquely written and terrifying book. Through her diary entires, we witness her slow decay into madness. Kaitlyn and her sister Carly are two souls that share the same body, with Carly "awake" from sunrise to sunset and Kaityln "awake" from sunset to sunrise. Kaitlyn refers to herself as the Dark Half and Carly as the better of the two. Another piece of their lives we get to encounter are the notes they write to one another through purple post-its or their message book. Their relationship is extremely interesting as they consider one another sisters and state they've been together since they were born, that their parents knew, and look forward to the day they can move to London and have it just be the two of them. After leaving the mental hospital and going back to school Carly befriends Naida, a girl from Fair Island who believes in Mala and is convinced that Kaitlyn and Carly are two souls sharing one body, refusing to believe Dr. Lansing diaganious of DID (Dissociative identity disorder, once called multiple personality disorder). She warns them that this is dangerous and evil spirits will be after her, which happens after a Halloween party where their friends play with an Olen board, which brought Kaitlyn / Carly to the attention of said malevolent spirits. While the story before this was interesting, after Halloween is when things really take a turn and you find yourself completely sucked into the story. I couldn't put The Dead House down! The mixture of diary entries, videos, and interviews keeps you guessing and trying to figure out what is happening, but you have no idea. This is one of the best things about Dawn's writing, in my opinion. I didn't need a standard narrative to enjoy this story or characters. 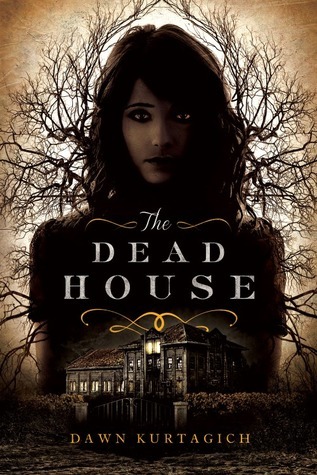 If anything, such a narrative wouldn't have made The Dead House as perfect as it is. I cannot say enough good things about this novel and I don't want to speak too much more about the plot because I don't want to spoil things. Half the fun of the novel is getting surprised by the twists, turns, and scares on each page. You won't regret reading this into the late hours of the night - just make sure you can convince yourself that those noises are your dog and not something in your closet.